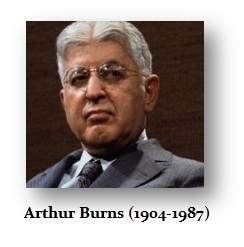 Arthur Burns was an Australian born American economist. Taught at Rutgers University and Columbia. In 1950, be became President of the American Economic Association having built a considerable reputation for his work on business cycles. He chaired the Council of Economic Advisers under Eisenhower, and later advised Nixon in his 1960 and 1968 Presidential campaign. After election, Nixon appointed Burns as Counselor to the President. He became Chairman of the Federal Reserve’s Board of Governors in 1970, a period of great economic instability. His chairmanship has been characterized by attempts to steer a middle course between ‘Monetarist’ and ‘Keynesian’ policies.